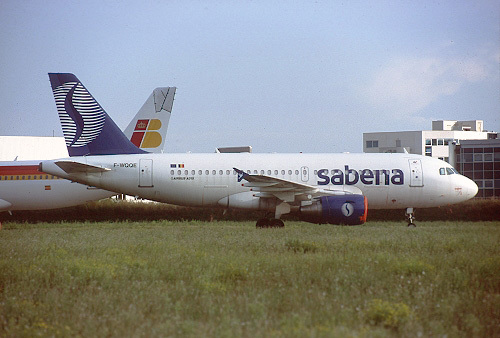 Description: fourth A319 of Sabena arrived at Brussels on October 22 1999. Next day it became operational, carrying only one color scheme. It remained active till one day before the carriers demise on November 7 2001. Description: after bankruptcy, the airframe was returned to the lessor and was ferried to TLS with French test registration "F-WQQE" on March 1 2002 for further storage. It remained in Sabena colors till at least May 2003 when it was seen all white at XYT. It migrated to Meridiana in May 2004. Description: it came back to Brussels Airport on August 2 2010, wearing the registration "EI-DEY" of previous operator Meridiana but in the livery of Brussels Airlines and two day later entering again the Belgian register. 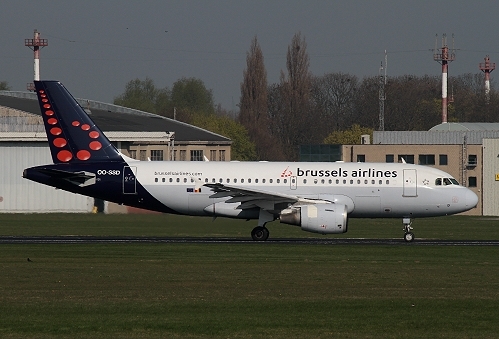 Sixth A319 in their fleet, commercial services began on August 22 2010 and the frame is still current with the carrier.